It’s been too long since my last post! And since I don’t have a specific topic that I want to report on about life here these days, consider this the first ‘odds and ends’ or ‘bits and pieces’ or ‘this and that’ blog entry. Weather Report: After a two week stretch of very hot weather, the last couple of weeks have been cooler temperature-wise. In fact, we even had some rain and thunderstorms last weekend, with very dramatic lightning and thunderclaps. And the nighttime temperatures got cool enough that we slept UNDER blankets. While I really liked seeing the rain, the unseasonably wet weather was not completely welcomed here as it is wheat-harvesting season and there is concern that the rain will cause mold in the wheat crop. In’shallah, all will turn out well. And as of today the heat is back. Work Report: I continue to have good turnout for the classes I teach at the Dar Taqafa (House of Culture), particularly the yoga class I run. Next month Noa and I will hold a two-week art camp for youth ages 8-16 at the Dar Taqafa, and I am having a nice time with Noa developing the camp curriculum. It has been harder to get youth to attend our English classes at the Dar Chebab (youth center). Thomas and I met with the director of the Dar Chebab this week to brainstorm ways we can get more youth to attend the center as enrollment is low these days. We plan to survey youth in the community over the summer about what types of activities they would enjoy doing, and will then start some new clubs this fall. 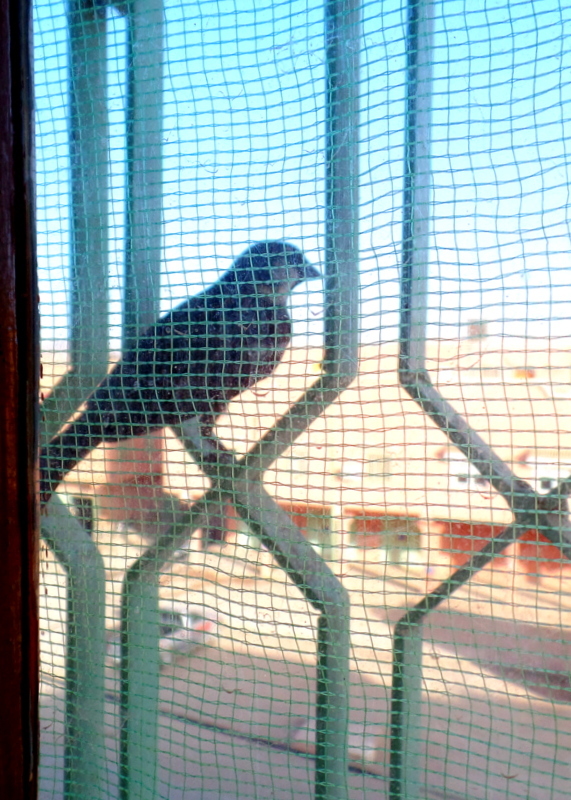 Our windows are reflective, so when birds perch on the grating we can watch them super close up! So fun! Well-Being Report: Last week I had a rough day when my mind started wandering down a dark path of questioning whether I was doing enough in my service so far, and if what I am doing is actually helping our community. After several hours of ‘woe-is-me-ing,’ I pulled out my computer and created a list of all the things I can do to more constructively pass time when I am not teaching or prepping for classes. I also developed a daily schedule for myself that includes regular exercise and time for journaling. I feel much better now that I have adopted a more structured and balanced routine. And at this moment I feel quite certain that Peace Corps service is what I am meant to be doing. Forget sausage, hamburgers and Coke. Hook this American lady up with some steamed kale, quinoa pilaf and tamari sauce. And some apple pie a la mode, too. When I think about my motivations for serving as a Peace Corps volunteer, broadening people’s understanding of American culture is certainly among my goals (Peace Corps calls it ‘Goal Two‘). Perhaps because I myself don’t eat sausages, hamburgers or fast food (but I admit I like a good sandwich! 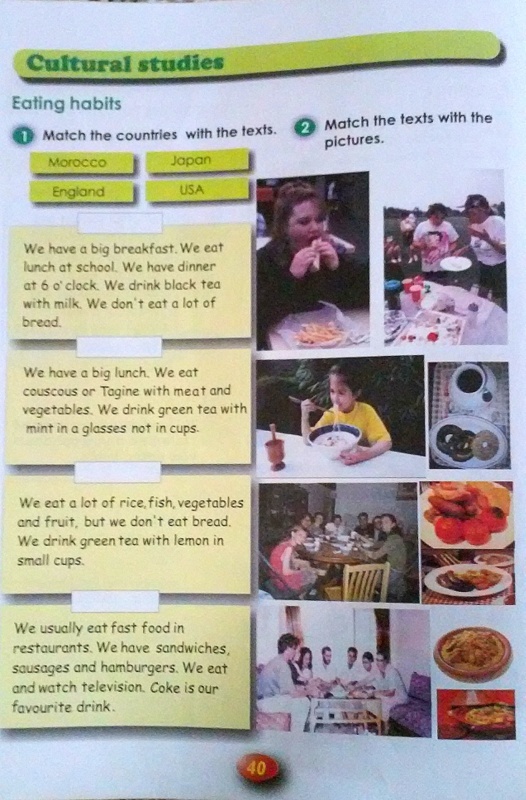 ), I tried to explain to the student that not all American (or Japanese or British or Moroccan) people eat in the manner his book described. But with my limited Darija and his limited English I don’t think he really understood what I was trying to explain. “Ma-kanakul-sh hambuger u sausage u Coke! (I don’t eat hamburger and sausage and Coke)” I said rather boldly. “FaHmt? (Understand)?” This poor kid looked at me like I was hmq (crazy)! And looking back on the interaction I suppose stating this without any supporting language related to generalizations and diversity was not terribly useful. But at least he knows I don’t eat sausages. Or hamburgers. Or coke. 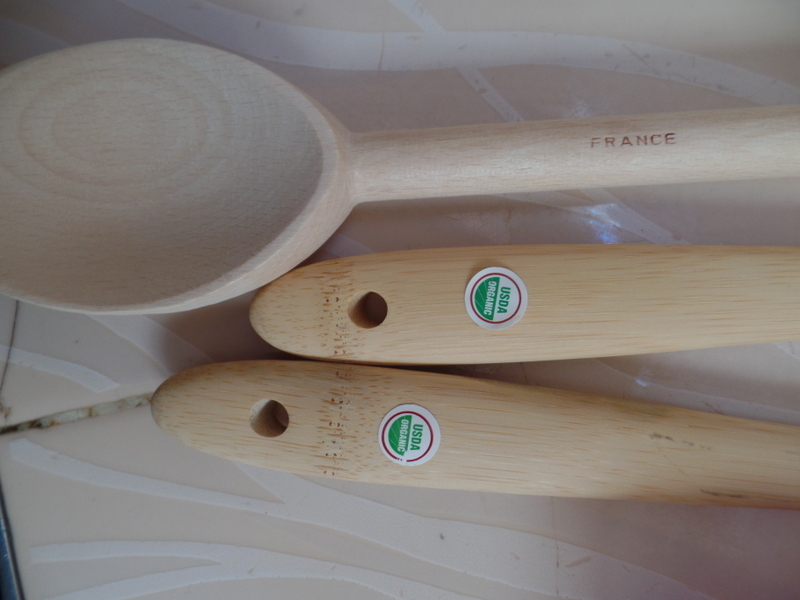 Two organic bamboo spoons and one from France! But they won’t be used to make sausages or hamburgers. What Else, Erika? Report: Well, perhaps most exciting is that we received our first care package from my Mom! Yes, at 41 I can still get a care package. But unlike the things that many other PCVs receive (candy, cookies, gum and Kraft dinner), I got first-aid gel packs to freeze and use to cool down, some organic bamboo wooden spoons to cook with, and a set of silicone ice cube trays. Thomas got a book on yoga. Yup, that’s how the over-40 crowd rolls when it comes to care packages. Take that, Kraft Mac and Cheese! Well at least you tried to explain what Americans eat. I don’t eat those things either, but do drink coke! Thanks for the update and the humor. I am glad you still feel you are doing what you are meant to be doing. I am glad the package finally arrived… it only took 3 weeks! And happy late birthday….I love reading your blog- In addition to all your gifts, you are a gifted writer. I feel engaged and curious reading your blogs. I am going on a traditional 10 day silent Buddhist meditation retreat next week. Not Western style, no poetry, no drumming, just sitting from 4:30am to 9pm. What’s the worst, if Enlightenment gets too intense, I can comfortably fall back to busy mind. If you google “kraft macaroni and cheese ingredients change” amazingly Kraft is dropping out artificial preservatives and colors for natural ingredients like tumeric & paprika – – – about time ! Speaking of (mis?) perceptions – do you hear or does anyone share theirs about current culture / politics ? … or best that PEACE Corps folks avoid this? Sounds very challenging,some amusing, and all stretching your view of the world and your place in it. Ride the waves as much as you can. You are not responsible to complete the work.